Alright, everyone. Phhewww! I got through the latest suggestions. I hope you are happy, animus! Now, when is our translation of the Historical Development coming? Just kidding. I know that will be a massive document to bother translating. anonjedi2, I've completed your latest audits up to page 39 of the I$$ thread. Thank you both for all you do. hoi.polloi » January 17th, 2018, 10:55 pm wrote: Thank you both for all you do. Seconded and I'd also like to thank you, Hoi, for your time and efforts maintaining the quality of the forum. If you should find yourself in Minnesota when I am there (I spend the summers there, mosquitoes be damned) I'd love to buy you a beer! I still think SSL should be implemented, but I am not sure how to help with that effort. If you decide to take another stab at it, I'd be happy to offer guidance/support. Just let me know. I can't find how to change my e-mail address or even see what e-mail address I registered. ADMIN NOTICE (simon): Dear Seneca, I've sent you an e-mail about the issue - should be fixed now. Instead of their only location being elsewhere, it sure would be nice to have all of your 19 videos hosted here and/or here Simon? Last week, we successfully implemented security to the site (https) which encrypts data and ostensibly protects people. I am not buying it since I think there are probably very strong hacks (in possession by intelligence agencies I'd assume?) that can get around such site behavior. But why have we done this? However, there may be a few consequences because the forum was not built under SSL and it may cause the occasional bug. If you notice any weird behavior, please let us know and we'll try to look into it when we can. I've had to click the link at the top of septemberclues.info to access the forum. Thanks fbenario. I get some weird error occasionally which is completely different. If you don't mind please sending me your browser and operating system info in an e-mail I will try to get to the bottom of this. It may take a while and once more thank you for your help and patience. Just to be clear, this is not when you go to the login page but when you hit the LOGIN button after you enter your credentials, correct? What URL were you attempting to access when you got that error? Were you clicking a link or accessing a bookmark? As a result, and unsurprisingly (due to trying to access an https URL on port 80, which is default for http) I get a "Secure Connection Failed" message, specifically: SSL_ERROR_RX_RECORD_TOO_LONG. When I remove the :80 from the URL, it works fine - so my advice is to figure out what mechanism is adding that :80 to the URL and nix it. Good work on implementing SSL, imperfect as it may be, and good luck on resolving the issues! P.S. Apologies for not making it to ALCON today. My kids came down with a moderate illness and I was needed here. I still hope to make it down tomorrow and not let my $80 registration fee go to waste. I hope things are going well there - give Phil Plait a kick in the shin for me. Health takes priority. Glad you didn't come today either since I was resting from the convention. That switch to the right https port sure worked spectacularly. Thanks for pointing me in the right direction. fbenario, please see if that fixed your LOGIN button issues. I think I did numbers 3 and 4. Right now I had no problem entering the forum as usual, clicking on Login at the bottom of the home page, with no 'SSL error' messages. What I don't know is if today's smooth login results from my Chrome 'SSL error' fixes last night or any programming change by Hoi today. 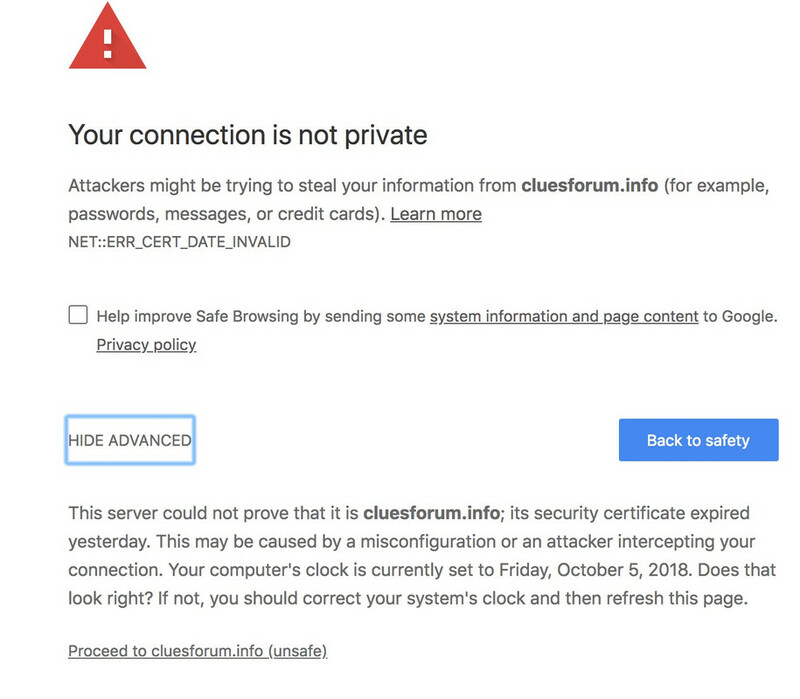 I received this warning from Google for the first time ever, visiting CluesForum today. anonjedi2 » October 5th, 2018, 7:40 pm wrote: I received this warning from Google for the first time ever, visiting CluesForum today. Yes, there was a technical issue that arose briefly this afternoon. The site is secure. I had to “tell” my computer to “allow” access here after it got resolved. This is a big problem affecting all users. Google has now made SSL certificate mandatory for all sites and Cluesforum does not have one or it isn't valid? Every time I load a page from Cluesforum on my Android tablet, I get the nag screen above and are not able to switch it off permanently. You should be able to get an SSL certificate for free at https://letsencrypt.org or renew the one you have. To me this is obviously a way to implement internet censorship. Have all sites implement this technology and have all webbrowsers make it mandatory for "security reasons". Then when it's established it's time for the bait and switch. Revoke certificates for sites that do not support "human values" and it will be very hard for people to access them because they will see the message above, and in the future sites without a certificate will probably not be accessible at all. Edit: I get the same thing on my phone, so it's definitely an issue with Cluesforums SSL certificate. I’ve gotten the same thing. pov603 » October 6th, 2018, 11:54 am wrote: I’ve gotten the same thing.